Barring any major upsets in the playoffs, Monday’s home finale will be the final NFL game ever at Candlestick Park. For many 49ers fans, the stadium holds a lot of memories of Hall of Fame players, unforgettable games and games that will live forever. But of course, the stadium isn’t all peachy. Traffic and weather had always been the biggest issues with fans at the game and it still remains today. @SamuelYLam riding the escalators. Night games and the subsequent paying like $40 to rent blankets. The Red Rope guy. @SamuelYLam mind you, for me it was primarily @SFGiants games. Only went to one @49ers game. @SamuelYLam, the history of that great place. From the Beatles, the Pope, the #SFGiants and of course, the #49ers. Not miss the after game traffic! 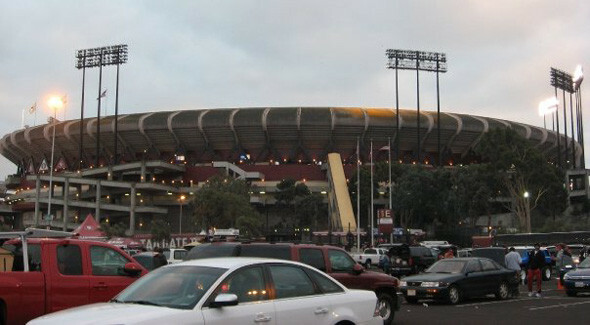 RT @SamuelYLam: What will you miss (or not miss) about Candlestick Park? @SamuelYLam Miss: The cold air. Don't miss: Fighting crowd traffic to get on the field. @SamuelYLam I will not miss the ridiculous amount of time it takes to leave after games. @SamuelYLam Will not miss the traffic. Will miss the stadium club. @SamuelYLam miss tailgating with the best fans and the bright green grass when you walk in from tunnel. Don't miss uncomfortable seats. I haven’t bought tickets to Monday’s game but I want to see if the prices drop low enough a few hours before maybe I can snag a deal. Regardless, I think I will be there no matter what the price. The stadium wasn’t great, but the memories keep me warm. This entry was posted in Column, MLB, NFL, San Francisco 49ers, San Francisco Giants, Social Media, Stadium, Technology, Twitter and tagged Candlestick Park. Bookmark the permalink.